Hi there friends! Don't you love it when what you have been working on perfectly ties in with something you needed to do anyways? I made this project last week but saved it because its just right for this week's challenge at Heart2Heart Challenges - All that Glitters! Make sure you get to the bottom of this post because I have a PRIZE for you this week! As I mentioned a couple of posts ago, my little crickey bug and my Artiste Cartridge got a SERIOUS work out when I was prepping for my daughter's 17th birthday party. I made ALL the decorations, all the party favors, party hats, treats and just about anything else I could think of with paper, glue, a serious amount of glitter and a ton of love. I poured a lot of creativity into the party which helped keep the cash flow down (funny how that works hunh?). This is one of the party favors that I made with the girls so it did double duty - it was an activity to do plus the girls took theirs home to remember the day. Here is my glittery part - I cut all the crowns from our new Silver Glitter paper! Wowzer! I'm a big fan of our Silver Glitz Gel and have used it to cover a lot of stuff but this paper tops even the Glitz for shimmer and shine. Its shimmers like a thousand diamonds and cuts like butter with the Cricut! 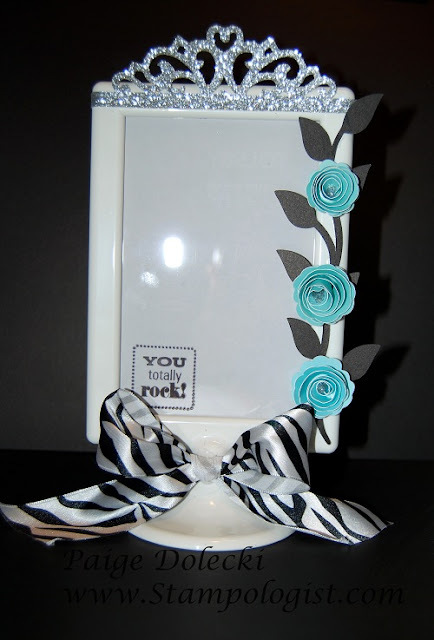 Add a couple of rolled roses with a few dollops of Glitz in the centers. 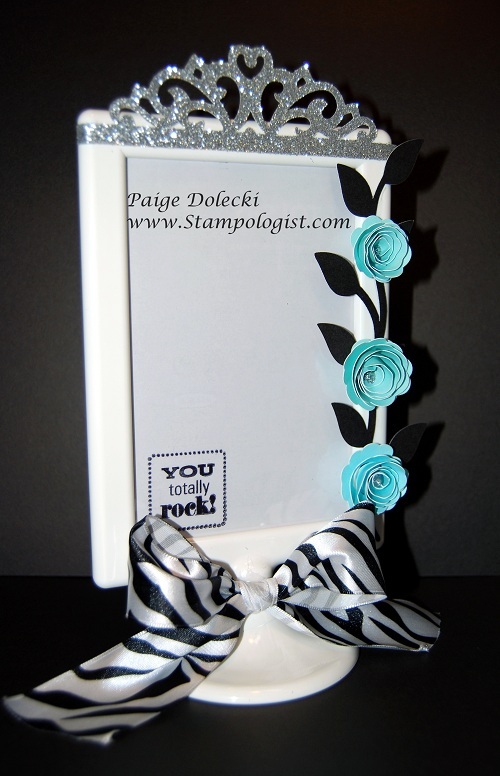 I stamped the acrylic photo cover with our Archival Black Ink using one of the stamps from Whoo's Your Valentine. There is another clear cover on the back that I stamped with another saying so the girls can switch the photo caption out. I found these frames at Ikea a couple of weeks ago for just .99 cents each! Can you guess what the theme of the party was? So leave a comment and then head on over to Heart2HeartChallenges.blogspot.com and see what glittery goodies the rest of the Design Team has for you and then put a little sparkle in your life by getting YOUR glitter on for this week's challenge! What went into this project? Let's see--was it a princess party theme? I love how cute your frames are--I'm sure the girls loved making them too! Thanks for the inspiration! 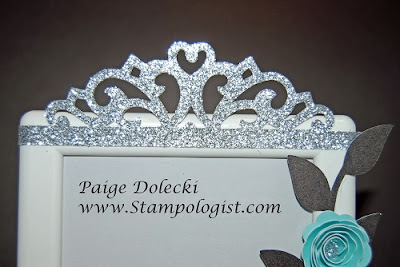 LOVE this frame and the glittered tiara is so adorable!!! Hi Paige, Your frame is adorable. I have grand-daughters and this would be a sweet treat for their dressers. I am a ctmh consultant and enjoy seeing your posts on the art board. Your blog is beautiful. I am new to blogging and am inspired by yours. I love this frame! Such a great idea. Where did the actual frame come from? Thanks for sharing it. This is so cute. I'm sure that your daughter and her friends will love this too. My daughter will be 18 in a couple weeks. Thanks for the fun idea. Was this theme Snow White? Awesome frame--I love it! Thanks so much for your sweet comments! Keep the guesses coming - it wasn't princess or Snow White but those were great guesses! I bought the picture frames at a local Ikea store. They come in an variety of colors white, orange, green, red (as is shown in the new Idea Book)and dark blue. They are called Tolsby and cost .99 each. If you don't have an Ikea store nearby, I know they ship but I have no idea on the cost. I bought one of each of the colors and a ton of white ones to play with. I really wish it came in black too! I did 11 frames total - one sample and 11 with the girls. We had another craft item that I'll show later in the week which took longer so while they were off doing the dessert buffet I rolled all the roses for them and hot glued the bows. This project went together REALLY fast but they had fun personalizing how they did the crowns and the vines/flowers. It was a great, inexpensive and fun party project that they really liked taking home! What a great idea! I'm sure your daughter appreciated all of your hard work. I love this! Thanks for sharing. Paige - this is such a great idea for teenage girls. I'm sure they all had a wonderful time making. Absolutely fabulous, Paige! I love those frames - when I mentioned them on the BB I think you were the one that told me they were from Ikea. Unfortunately, there is no Ikea here, and they don't ship this item. I need to see when someone is traveling to CA!! Anyway, my guess is a Tiffany's theme - maybe "Breakfast at Tiffany's"? I say this because of the bling and the Tiffany blue flowers! What can I say? You rock! Holiday Expressions New Product Blog Hop!